Development from an egg to adult organism is an inordinately complex process, yet it is remarkably resilient, as it has to be for survival in natural environments. My research focuses on how physical processes mediate environmental effects on development. Tissue deformation and cell movement transform the ball of cells of the early embryo into the complex morphology of the adult. Myriad physiological and genetic factors control the mechanical forces that drive and resist these shape changes. In turn, cells can detect and respond to forces acting on them and to the stiffness of their surroundings. Therefore, mechanical processes could drive or moderate development-environment interactions. My previous work suggests that the way in which morphogenetic forces change over time may be critical to allowing morphogenesis and patterning to stay synchronized at different temperatures. However, embryos are resilient to surprisingly high levels of tissue stiffness variation, possibly because cellular force generation and stiffness are controlled by many of the same proteins, so they may rise and fall together. One ongoing research project focuses on how salinity variation – which swells or shrinks cells – affects the morphology of, and forces within, early embryos. I hope to use this system to test whether mechanical interactions between cellular and non-cellular parts of the embryo influence sensitivity to teratogens. I am focusing on sea urchins and other echinoderms because of their simple geometry. Another ongoing project – in collaboration with Dr. Yasmin von Dassow – asks how intertidal gastropod embryos survive extremely high levels of water loss, and a third project focuses on mechanical signaling in ctenophore embryos. 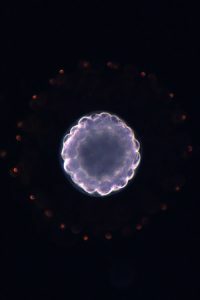 Ctenophores are an early branching group of animals, so understanding mechanical signaling in their embryos will give insights how roles of mechanical signaling in development have evolved. Finally, I am using a modeling approach to ask how feedback from functional cues allows organisms to produce stable transport systems. In my graduate research, I found that feedback between flow and conduit size organizes a decentralized, sheet-like biological fluid transport system in much the same way that it organizes vessels in plasmodial slime molds and the vertebrate circulatory system. Using highly simplified models, I hope to determine how the feedback rules influence system stability, and how sensitive the process is to differences among these systems. Comparing these systems may suggest ways to generalize optimization algorithms inspired by flow-regulated patterning in slime molds, or inspire novel transport network designs that better support both construction of artificial tissues, and cell growth in those tissues. I completed my Ph.D. in the Integrative Biology Department at U.C. Berkeley, and then did a postdoc in the University of Pittsburgh’s Bioengineering department. Most recently, I was an instructor at the Duke University Marine Lab and at the University of Washington’s Friday Harbor Labs. For a list of publications, see my profile on Google Scholar.